It fits perfectly in your hand luggage! Wherever you are, even on the airplane or maybe already on your sofa at home – go on a sightseeing tour in Hannover 365 days a year – be the weather as it may! This book will be a wonderful entertainer and companion. This souvenir of Hannover fits perfectly in your hand luggage! Also surprise your family, friends or workmates with this present. Your stay was much too short to become acquainted with Hannover? You are welcome to visit us again! 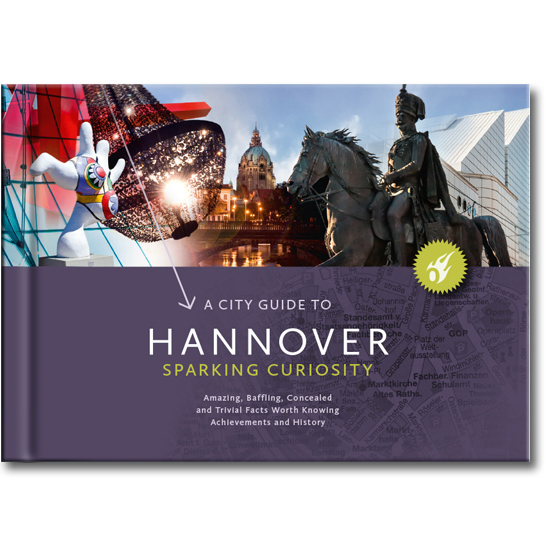 This book with its 200 colorful pages invites you to discover more of Hannover. Short stories tell you amazing, curious, historical and typical things about this interesting town. Visit popular spots or unknown places yet to discover! Multifaceted entertainment with compact and interesting information, Facts and Figures, world records, history, arts, cult and culture, myths and rumours – and also – some recipes.